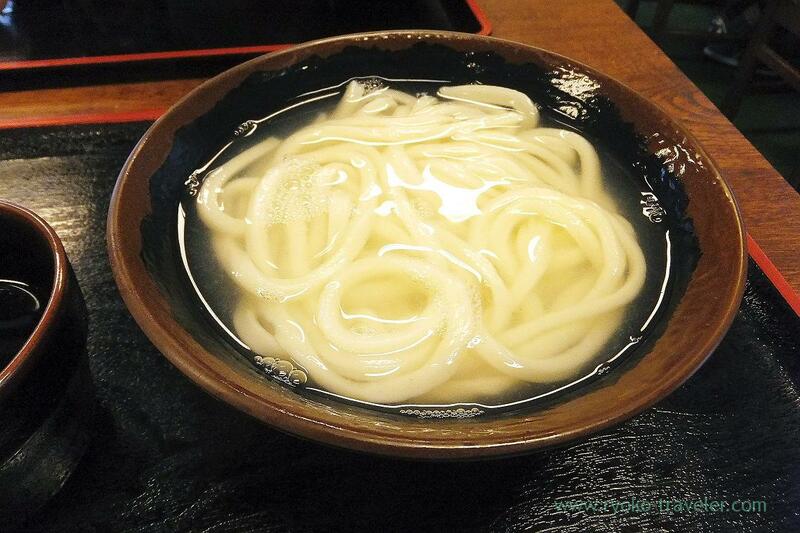 The last post is … about udon all the same ! We ate last udon at there. You might remember… this is the shop that we visited at first just after arriving at Takamatsu. I wanted to eat this shop’s kamatama butter udon. Well, I was suffering from car sick when we visited there first day. 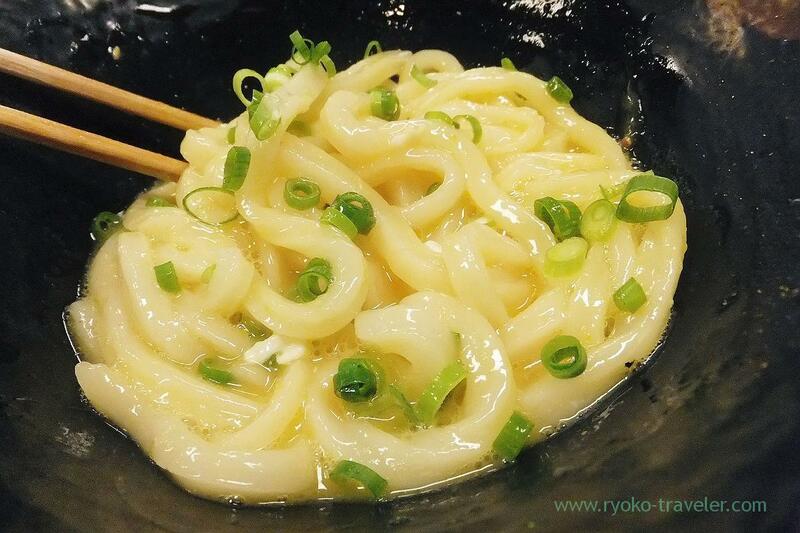 So, though I enjoyed hiyakake, I couldn’t enjoy kamatama butter udon that is the most popular udon in the shop. 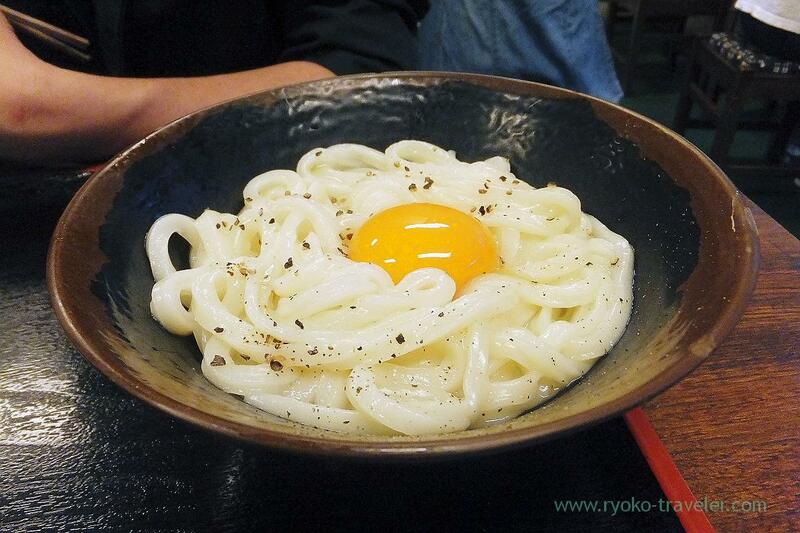 Kamatama udon have raw egg. It was hard for me to smell the raw egg that time. Nevertheless I love kamatama udon ! But… after this last udon time, we were to go to airport by bus. So, I thought I should not eat kamatama udon up. So, I ordered kamaage udon. And he ordered kamatama butter udon. And I ate about half of his kamatama butter udon ! 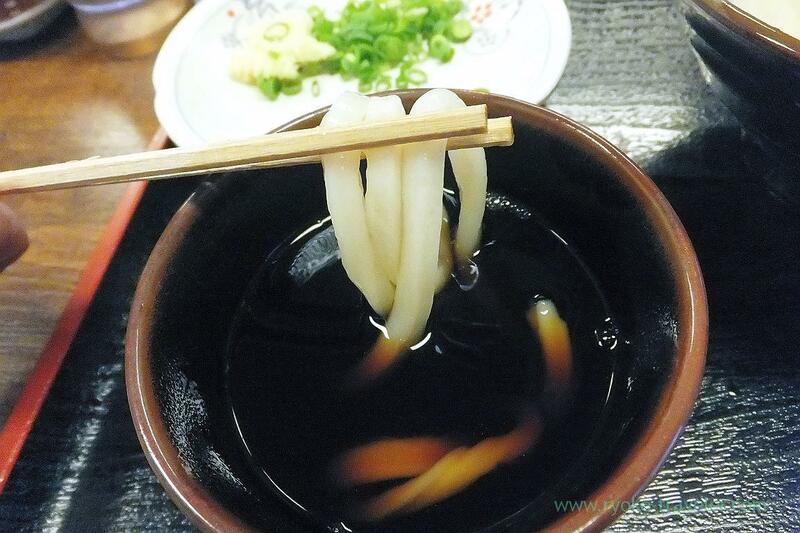 * “kama age” udon is served just after taken from (age : 揚げ) the boiling water in the pot (kama : 釜). “Kama” udon can be enjoyed hot, springy and soft texture and another udon give us tough texture of tighten udon by exposed to cold water once. So, our udon took more time to be served. They don’t use udon 10 minutes and more passed after boiled. Udon with black pepper, raw egg and sauce was served separately. Of course, condiments like green onions, ginger and so on, too. So, eater mix altogether well. The udon dressed with raw egg and sauce was really tasty. The smell of raw egg was comfortable ! Kamatama butter udon is called carbonara udon ! My Small size of kamaage udon (釜揚げうどん小, 320 yen) was good, too. The udon was served in the hot water and I put some udon into the soup and then ate. 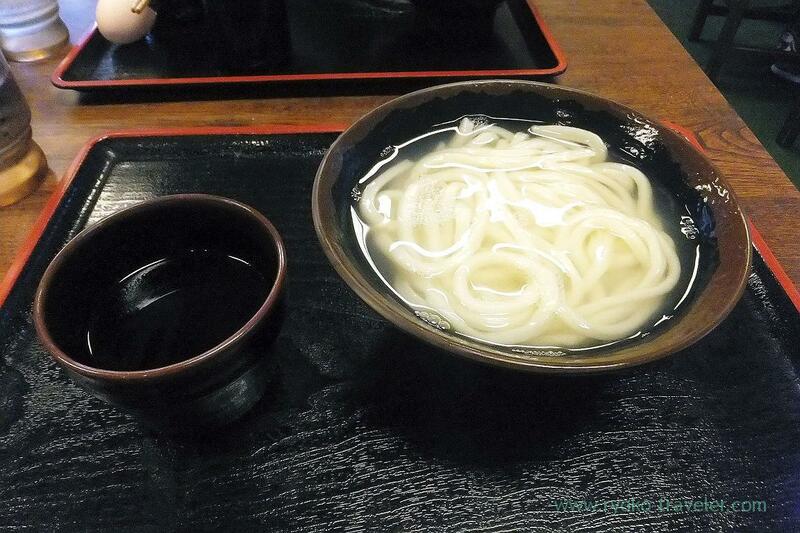 The surface of udon was more smooth and softer than hiyakake that I ate first day. I love udon hot all the same … Of course, the texture of udon that was exposed to cold water once and being eaten as it is cold is good and we can easily find the taste of udon itself. But hot udon and hot soup is comfortable. I could be relaxed. 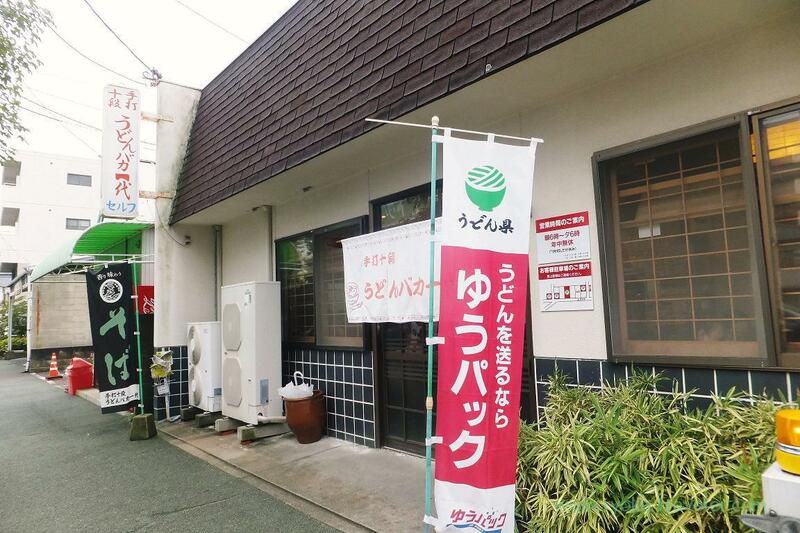 I thought every popular sanuki udon shops have much people gathering from another prefectures waiting throughout their business hours. But unexpectedly they didn’t have.I want to visit Takamatsu in the near future.